I am a big fan of shopping, may it be the just drool-but-do-not-buy kind of shopping aka window shopping, to the shop-like-there’s-no-tomorrow kind of shopping, to the quick-fillout-order-form-then-click-buy kinda shopping. In my humble opinion, the Philippines right now is definitely one of the best places in the world to shop what with the Philippine retail market being as it is today–dynamic, vibrant, customer driven. Big credit of course goes to the Philippine Retailers Association, who for the past years, has been continuously supporting and empowering retailers, suppliers, CEOs and top level managers of upcoming and successful brands to become at par if not better than their international counterparts through organized conferences and forums. 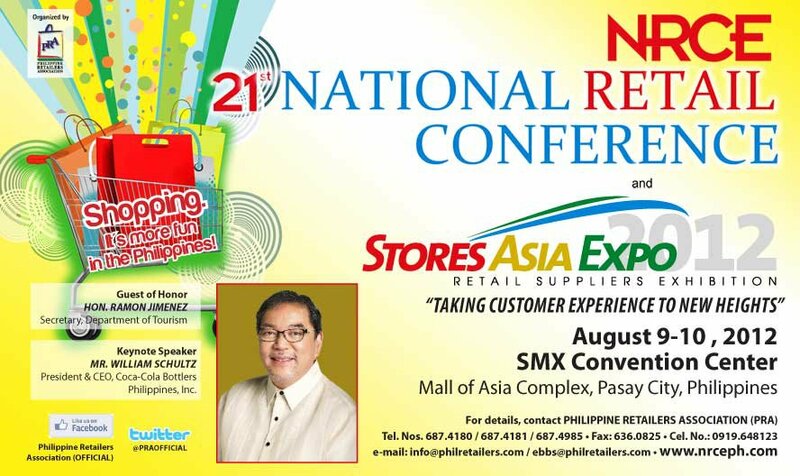 And true to its commitment of further boost the know how and skills of retail professionals under its clout, PRA’s much awaited 21st National Retail Conference and Stores Asia Expo (NRCE), is set to be held on August 9 to 10 at the SMX Convention Center in Pasay City. With no less than Mr. William Schultz, President and CEO of Coca-Cola Bottlers Philippines Inc. (which incidentally is celebrating 100 Years of Happiness), as the keynote speaker, the event promises to start and end on a happy note. Taking its cue from the Philippine government’s well conceived tourism campaign, “It’s More Fun in the Philippines”, this year’s conference will zero in on elevating customer shopping experience. It gathers people behind companies with excellent track records in customer satisfaction to share their tips and secrets to successful brand-customer relationship. The plenary sessions were designed in such a way that conference attendees will be provided with insights on the changing demands and tastes of customers and knowledge of how retail entertainment and store design can help improve customer shopping experience. panel discussion entitled “The New Turks of Retailing,” ( young entrepreneurs behind today’s hottest brands and franchises. Topics such as competitive edge of socially responsible businesses, licensing opportunities for retailers, the retailer’s role in advocating a sustainable lifestyle, and transforming employees into brand ambassadors will also be tackled. Plenary session on using an initial public offering (IPO) as a tool for retail business growth will also be covered. So if you are a retailer, supplier, manager or CEO of a certain brand or company, I highly recommend that you attend this conference as you will surely learn a lot from the retail industry’s big key players who will be present to share their insights, knowledge, and opinions on the current status of the retail industry. The heart of the conference for sure will be the discussion of topics such as how to gain competitive edge by being socially responsible and the retailers’ important role in advocating a sustainable lifestyle. I would sure love to see more brands living up to the challenge of sustainable growth and living as well as retail companies taking seriously their corporate social responsibility. Hopefully with this year’s conference, we will get to see a lot of companies who will jump to this challenge and succeed in the coming months. Personally, I want to sit down and listen to the presentation on “Global Brands in Local Shores: How Local Brands Can Compete and Succeed vis-à-vis International Brands.” I have seen how local retailers and brands have struggled to stay afloat for the past years. They went as far as hiring the services of foreign models/hollywood stars to represent their brands and have even resorted to sloppy marketing strategies to highlight their high global affinity (which sad to say failed miserably) in the hope that their products can keep up with high standards in brand representation set by their foreign counterparts. Hopefully from this presentation they will be able to gain insights on what proper marketing strategy or tool to employ in order to stay on top of the game despite pressure from international brands. We sure can improve a lot on brand representation as this is one area that most retailers seem to be struggling with. The topic, Living the Brand: Employees as Brand Ambassadors, also interest me as I recognize the critical role store employees play in selling their product to customers. As a consumer myself, I will surely come back to a store where employees know their products well and who can attend to my queries and concerns competently. Not all sad to say has those kind of employees. As it is, this is one critical area that most retail shops really need to address right now to gain100% costumer satisfaction. The 21st NRCE is proudly presented by PLDT Alpha Enterprise, SM Department Store, Hewlett Packard, Robinsons Malls, Araneta Center, Ayala Malls, Meralco, IBM Philippines, DHL Supply Chain Phils., Inc., Festival Supermall, Wilcon Depot, Celine, The Philippine Star, BusinessWorld, ABS CBN, Schutzen, Mobext, Inc., Crossover 105.1., Entrepreneur, Focalcast, Q Creatives, Cylix Technologies, Mediamagnet, Catalyst Media, Infinite Grafix, Travel Club, APL Logistics, Avolution, Live Media, Starmall and Bayantel. As an entrepreneur myself I would really recommend every entrepreneur to join because there are a lot of things that each one of us will learn and help our small business grow. Hope to join the event myself. Events like this really helps customers in the end as retailers get to share experiences and expertise that would eventually benefit end users. Great post and am going to repost on my business page! My two cents. The malls here are overdosed on Western goods. Although I do enjoy a Big Mac and a Krispy Kreme from time to time, I really really would like to see more pinoy companies offer substitutes for these products. Jollibee comes to mind. very knowlegable and great stuff provided. I always have the same feeling as yours every time I intrigued with shopping stuffs. Glad to came here. This articles is quite nice. Philippines is definitely a great place for shopping. Being into franchising, i have seen many retail and small business blogs and forums but this blog feels to be very good. You have some really good ideas in this article. I am glad I read this. I agree with much of what you state in this article. Your information is thought-provoking, interesting and well-written. I saw your author bio and I was amazed on the number of awesome articles you have written for this blog. And I am agree on your post that the Philippines is the best places in the world to shop for, but that is ironically because many Filipinos are still poor in our country. Who doesn’t love shopping? But, whoa, Philippines! Really good one. Its a nice post. At first I want to say thank you for sharing with us this kind of tremendous posting. Its my personal opinion that, Buying is much more effective than rent because then we have the freedom to do anything for next. I’ve seen a lot of malls and other establishments in the Philippines; not only in the cities but on towns as well. I say the country is developing. It may not be too fast, but you can feel the speed. Great awesome post really I like this is Stone Dead Fashion is a ready-made garments,sportswear,jersey manufacturer. Our main products are all kinds of garments item like trousers, shorts, shirts, t-shirt, polo shirt, sweet shirts, Sportswear, Jersey, Cap, Hat and sweaters with all kinds of Fabrications. Our factory is located in Ashuliya, the biggest international small commodity city in Dhaka, Bangladesh. We’ve been in Apparel industry more than 12 years and we always offer products with good quality and competitive price. If you need clothing item. From street bazaar’s, malls to online shops. Philippines has been booming on these. From bags to accessories. Really your way of comfort. piece of writing, in my view its really amazing in favor of me.